Oh cupcakes, you wonderful things you. I grew up a baker, and while I've slowly become more of a cook and forgotten my weekend long baking binges in high school (I baked all of my friends customized batches of goodies...which I miss having time to do that kind of stuff). I wanted to make this really crazy red, white, and blue cupcake idea (that turned into pink, purple, and yellow) because I've been strangely into American colors lately. Once I got the cake down (first batch was meh) these were quite yummy. Preheat over to 350 Degrees. Add all of the dry ingredients together and mix well. Sift them if you feel so inclined. Ina mixer, cream together the butter and sugar until light and fluffy. Add in vanilla and eggs slowly. Then add in flour mixture by the 1/4 part alternating with the fat free half and half over a slow speed. Wash strawberries and dice. Then add to cupcake batter slowly. Soon batter into cupcake wrapped laid into cupcake pans, filled to 2/3rd up. This should make about 12 -16 cupcakes. Bake for 25-30 minutes at 350 Degrees until a toothpick placed in the middle comes out clean. 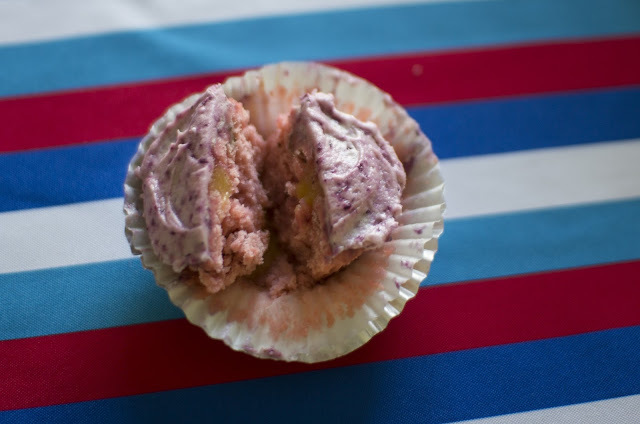 Cut a small hole in the middle of cupcake and remove the cake. 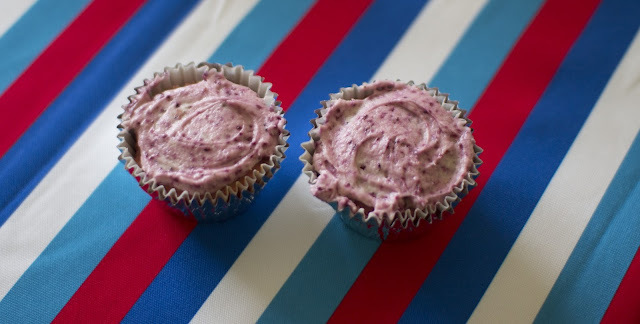 Use a small teaspoon (1/8 or 1/4) to fill the cupcakes. Recipe from My Igloo Life - better instructions here. I made this really late and didn't photograph - oops! Whip butter. Slowly beat in the blueberry puree. Add vanilla and lemon juice. Once well mixed, begin slowly adding sugar until light and fluffy. Top cupcakes with icing and voila! 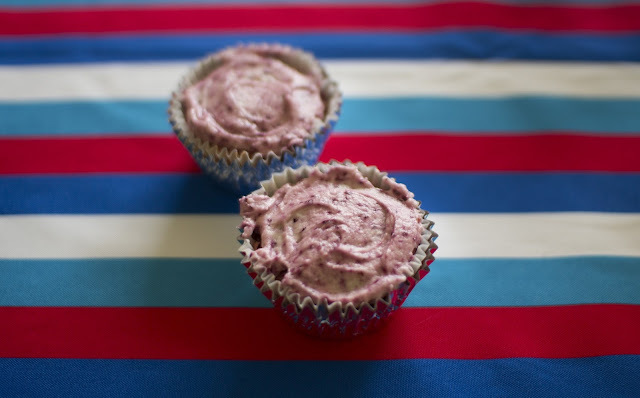 Red, white and blue (ok, pink, yellow, and purple) cupcake! These sound really yummy! One thing that amuses me about reading American blogs is that you guys call the flours different things. You had me at "butter and sugar." Heheheee! These look absolutely amazing, yum. Especially that blueberry icing! Mmm this flavor combination sounds so tasty! Man I wish I had one of these right now! WOW! I need to try this. Looks so nhummy! Thanks for sharing.